Publication date: November 2000; Naval Institute Press, Annapolis, MD. 296 pages, 41 photos, 2 illustrations, Appendixes. Notes. Bibliography. Index. Hard cover. Hastily built at the onset of World War II to stop German U-boats from taking their toll on Allied shipping, the 110-foot wooden subchasers were the smallest commissioned warships in the U.S.Navy yet they saw as much action as ships ten times their size. In every theater of the war these workhorses of the fleet escorted countless convoys of slow-moving ships through submarine-infested waters, conducted endless mind-numbing antisubmarine patrols, and were used in hundreds of amphibious operations. 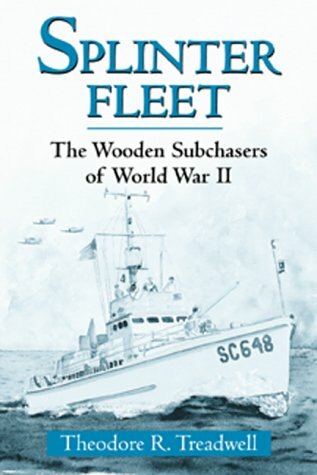 This book, written by the commander of one of the subchasers, defines their place in World War II naval history and gives readers a taste of life aboard the wooden warships. Ringing with authenticity, it describes the cramped quarters and unforgiving seas, as well as the tenacious courage and close bonds formed by the men as they sought out the enemy and confronted nature. Long overshadowed by the larger, faster warships and more glamorous PT boats, subchasers, until now, have been mostly forgotten. This work restores the plucky little ships to their hard earned status as significant members of the fleet. Many of the photos included here were taken by the author during the war. —Norman Polmar, author of The Naval Institute Guide to the Ships and Aircraft of the U.S. Fleet, 17th Ed. THEODORE R. TREADWELL, a graduate of Rutgers University, was in his second year at Harvard Business School when the Japanese attacked Pearl Harbor and he accepted a commission in the U.S. Navy. Less than a year later he was on a subchaser in the South Pacific where he spent the next two years, including nine months as commanding officer of SC-648. At war’s end he left the navy, enjoyed a successful career in the packaging industry, and raised five children. Upon retirement he began to think about his life on the subchaser and started research for this book, a process that took more than five years. Treadwell resides in Bellingham, Washington. “does a delightful job of unraveling a series of historic, and almost forgotten, stories” —Matt H.